come and relax in the beautiful green nature of our mountains in our cottage situated in a small village 900 m. altitude, the valleys of Seythenex. Discover the Val de Tamie, massive bauges with these breathtaking views, the walks in this quiet hamlet at the foot of the Belle Star. Lake Annecy near offer many activities, family swimming at the water's edge. The activities available to you are limitless, there we will be your advisors, documentation and brochures will be available. 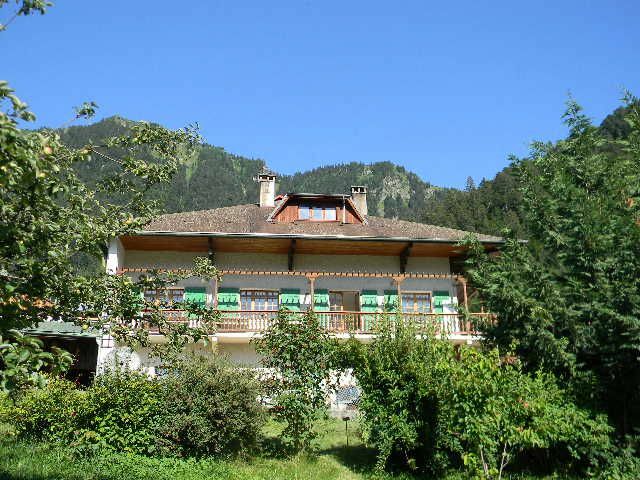 Near Lake Annecy, the mountains, furnished 4 stars in a Savoyard style, this charming accommodation is comfortable (4 stars tourist office) with complete equipment, equipped and functional kitchen with oven, fridge, microwave, hob and dishwasher in a warm living room of 30 m² with fireplace. Two stunning independent rooms and a tidy bathroom with walk-in shower. A TV with DVD player and Internet to stay in contact with possibly the world. A laundry room with washing machine and also a closed bike, ski ..
Garden furniture, barbecue in your private space, sun and relaxation quiet with wonderful views. On the spot, fresh eggs and organic vegetables will be at your disposal next season. Accepts holiday vouchers (30%), baby's necessary (bed, bath) available and free. The property is difficult to find using sat nav but the proprieter very helpfully guided us in. A clean and well maintained apartment. With everything you need. When you book linen this does not include towels and tea towels. The knives in the kitchen could do with sharpening. Overall a very good location and a very comfortable place to stay. The property was a little difficult to find initially but this only adds to it's charm once found. The apartment is part of a large property located within a small hillside community. If you enjoy the outdoors you can't help but love the location of the property together with its stunning views from the balcony. The apartments well sized and well equipped for self catering use and the owners are very helpful and welcoming, we will certainly be looking to visit again in the future. Grosse Ferienwohnung freundliche Vermieter insgesamt jederzeit wieder! séjour ressourcent,au centre de la campagne montagnarde à proximité de nombreuses activités. le gite est très agréablement bien situé, spacieux ,bien agencé. les cloches des vaches rythme les moments de détente sur le balcon avec vue sur la montagne ,avant quelques randonnées ou visite d Annecy son lac et les environs. Peut être qu'il pourrait y avoir un peu plus de vaisselle (ex : grande planche à découper, quelques coupelles) mais ce n'est pas très grave.